A. I was working one day when an unusually rude, smelly homeless man came to my teller window demanding 75 cents for a phone call. When I informed him of the Bank's policy to not give away money for free he became very irritated. 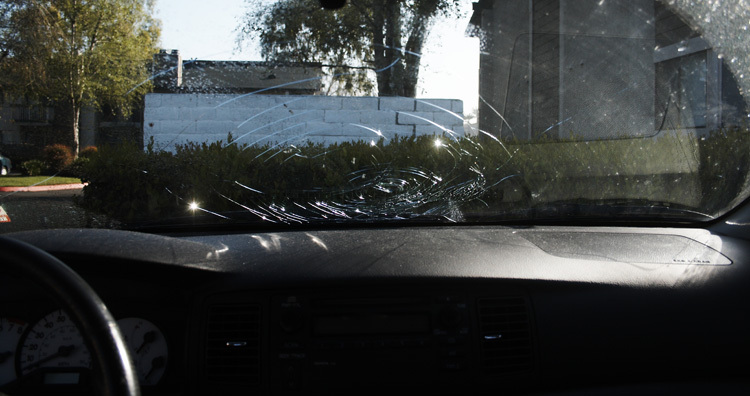 Knowing which car I drive because of the close proximity of the bench he sleeps on every night to the Bank's parking lot where I pull in every morning, he dramatically left the bank and in a rage smashed my shield with a large rock he had in his shopping cart. 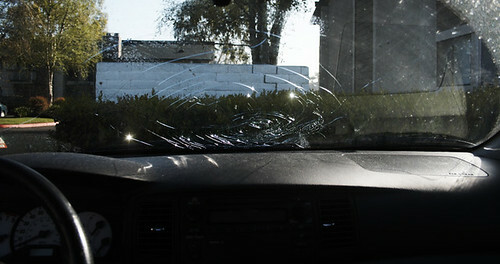 James, our security guard stopped him, but not before the damage was done. B. While driving alone on the freeway, a terrifyingly large piece of truck tire became air-born when a ruby red Toyota Tacoma glanced it. The Tacoma's distant Japanese cousin, my Corolla, was innocently drafting behind it in an effort to attain even better gas mileage than she already gets (and with gas prices where they're at now, who can blame her?) The truck tire honed in on the shield and succeeded in smashing it at its core. C. The light fixture above a parking spot in my apartment complex fell on the shield, rendering it useless and defeated. OH OH....I know this one!!!! I am going with answer number A. It's gotta be. D- you tooted in your car.